Teresa Tanzi: More Tax Breaks for the Uber-Rich? More Tax Breaks for the Uber-Rich? How is it that individuals making over $10 million get a tax break in the middle of a statewide budget crisis? (“Tax overhaul means wealthiest in Rhode Island will pay less,” Providence Journal, August 25, 2010.) These top earners are costing the state an estimated $10-20 million. At the same time our towns are being forced to raise property and car taxes because our representative, David Caprio, and the General Assembly claim they can no longer afford to provide the support to our towns. Well, whose priorities is Representative Caprio looking out for? Certainly not the interests of his constituents in Wakefield and Peace Dale, where our car and property taxes have gone up, and there is persistent talk of closing neighborhood schools. And he is not looking out for the interests of those in Narragansett either, where the maximum 4.5% cap for raising property taxes was hit once again. As a result of a June vote to dismantle the tax code, 30 individuals will benefit from this tax cut, while the rest of Rhode Island struggles. When we face unprecedented budget shortfalls and decide to “fix” the system that balances the budget, yet fail to bring in a single additional dollar, that is more than merely irresponsible, it is grossly negligent. Yet, to now peer through the smoke and mirrors and see a tax break, AGAIN, for the uber-rich is just more than our little state can bear. When we are told cuts to education and state funding for our towns must be made, we understood times were tough. Now to take that money and not plug the gaping hole in the budget, but actually siphon it off to the top 30 tax payers, is beyond reproach. >Once again, we have members of the General Assembly and the Governor to thank for putting our state on the path to financial ruin. We need to repeal this tax “reform” now, and put our state on secure financial footing. We also need to make sure we vote in September for people who have OUR priorities in mind, the other 999,970 Rhode Islanders who don’t make $10 million or more a year, but are actually struggling to keep our heads above the flood waters of a sinking state. 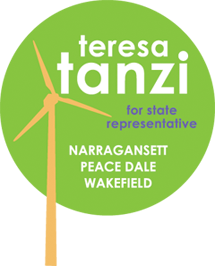 Teresa Tanzi is a candidate for state representative in District 34, which includes Narragansett, Wakefield and Peace Dale.